Well, here's a story we've heard before in a flavor we haven't. The Swedish Young Pirates association had a tent at a local municipal festival, and were handing out free waffles as an attraction. 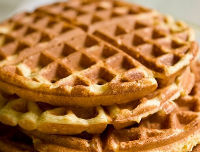 They were targeted with eviction from the festival, not because they weren't allowed to make food or give things away (they were), but because the traditional festival waffle makers couldn't get paid anymore. It sounds like a joke, but it isn’t. As described by Gustav Nipe, chairman of Young Pirate and one of the people giving out waffles at the festival. Instead of selling the waffles for 25 Swedish kroner [about 2.75 euros], the Young Pirates were sharing them for free. Local media (in Swedish, linked above) picked up on the event rather quickly. But I think this serves as an excellent example of what’s happening in the world at large right now, even if this was a conflict over waffles in the remote parts of a frozen country the size of a shoebox on the Arctic Circle. Guards and police are called in by businesses when there is a social or legal disturbance, on the assumption that maintaining the momentum of the economy is more important than people’s freedom to cause disruptions. But something interesting has happened lately. The social norms have changed so much with the Internet, that business rules have changed unrecognizably for those who have run their businesses the same way for decades. The social norms have changed so quickly, that the forces upholding order in society have lost their ability to tell a social disturbance from a business disturbance. The parallels to file-sharing are strong and present. If you can’t compete with the “free” that file-sharing offers, you can’t compete, period… but distribution executives around the world in monopolized copyright industries are trying to portray file sharing as a social disturbance to be dealt with forcefully, rather than a business failure. In this, copyright industry lawyers and executives are no different from the sorry waffle sellers at this local festival who tried to get a political youth organization evicted for giving waffles to the festival visitors. c There are 282 comments. Add yours?